for more information and reservations. 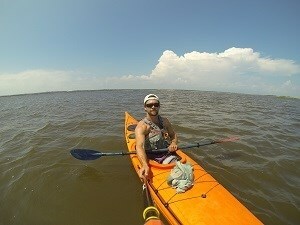 Matt is the manager of Kayak Carolina, kayak guide and instructor, as well as the surf instructor. Growing up in the Southern Outer Banks Matt has spent most of his life in the water. He is a graduate of UNC-Wilmington with a degree in Environmental Sciences. He also spent time as a kayak guide, surf instructor, rock climbing instructor, and a high ropes challenge course facilitator at UNCW. As an Eagle Scout and outdoor enthusiast his certifications include American Canoe Association Certified Instructor and American Red Cross First Aid/CPR/AED. He will be eager to give you hands on instruction on the best kayaking techniques (for the novice and the avid paddler), as well as guide your family through the amazing coastal ecosystems while explaining the ecology found here.